The 10:00 AM Ceremony is for Associate in Applied Science and Occupational Certificate graduates. Watch live during the event or watch the archive after. The 1:00 PM Ceremony is for Associate in Arts, Science, Engineering, and Fine Arts graduates. The Commencement ceremony is the culmination of the student’s program of study. 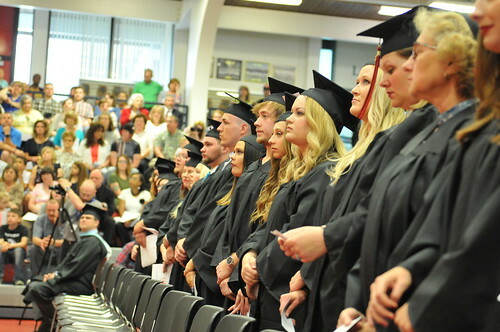 Each May, Rend Lake College conducts a graduation exercise whereby faculty, staff, family and friends come together to recognize and honor academic achievements. All eligible degree and certificate recipients are encouraged to participate in the Commencement ceremony. Participation in this ceremony is allowed prior to verification of completion of final courses. The student should be within six credit hours of fulfilling graduation requirements, and requirements should be completed in the summer session following May graduation. The actual degree or certificate is posted to the official transcript and the certificate or diploma is released when all requirements have been met and verified by the Director of Student Records. Students must apply to receive their respective diplomas for an Associate in Arts Degree, Associate in Science Degree, Associate in Fine Arts Degree, Associate in Engineering Science Degree, Associate in Applied Science Degree or a certificate for Occupational Certificate programs. Students who complete the Graduation Application form will receive a pre-graduation academic audit and be informed of any deficiencies. Meeting graduation requirements ultimately is the responsibility of the student. Students are encouraged to be familiar with the catalog and program requirements and to work with their academic advisors or counselors in selecting courses. Students may elect to fulfill the degree/certificate requirements of the catalog in effect at the time of their graduation. The student does not complete credit classes at Rend Lake College for two consecutive semesters, excluding summer terms. A period of five years elapses before the degree or certificate is completed. If students are unable to complete the requirements within the five-year time frame, they may appeal to the Vice President of Student Services to use a specified catalog other than the one in effect at the time of re-enrollment or at time of graduation. Students may be required to follow degree requirements outlined in later catalogs when certificate, degree programs or courses have been extensively modified from previous catalogs. The Vice President of Instruction makes this decision. CONGRATULATIONS Rend Lake College Graduate! The graduation ceremonies will take place in the College Gymnasium on Saturday, May 18, 2019. The graduation ceremony to be held at 10:00 a.m. is for Associate in Applied Science and Occupational Certificate graduates and the 1:00 p.m. ceremony is for Associate in Arts, Science, Engineering, and Fine Arts graduates. Your family and friends are invited to attend. Graduates must arrive at the South Oasis no later than 9:30 a.m. for the 10:00 a.m. ceremony and 12:30 p.m. for the 1:00 p.m. ceremony. Line up in alphabetical order. ENTRANCE/EXIT FROM THE CEREMONY - Graduates will enter the gymnasium from the north side, west door. The Associate Vice President of Academic & Student Services will lead graduates into the gym and will direct graduates when and where to exit. Graduates are asked to remain in their places until instructed to leave. PHI THETA KAPPA - Phi Theta Kappa stoles may be picked up from Jena Jensik in the Academic Advisement Center in the Administration Building Room 107. ANNOUNCEMENTS - Graduation announcements are available for purchase from the Rend Lake College Book Store. The Book Store will be open for business from 9:00 a.m. - 3:00 p.m. on the day of commencement. CAPS AND GOWNS - Students may keep caps, gowns and tassels as mementos. Caps should be placed on the head so that the mortarboard is level. The tassel is worn over the right temple and should not be shifted from one side to the other when the diploma is received. The Vice President of Instruction will direct students when to switch the tassel after all students have been seated. NATIONAL ANTHEM - The flag will be displayed hanging from the ceiling in the center of the gym and near the platform. Graduates are asked to observe the flag near the platform. Men are asked to remove their caps during the National Anthem. Women may leave their caps on their head. CEREMONY PROCEDURE - Graduates will rise one row at a time, as directed. Graduates will be directed to the stage. Students will hand the reader their name card, received when lining up for graduation. Students are not to approach the podium until their name is read. After receiving your diploma, continue walking across the stage to north stage ramp and return to your seats. Once the row is filled, you will be directed on your left side to be seated together. DIPLOMAS - A diploma cover will be issued at the ceremony and the diploma will be mailed if all requirements are completed. There are a large number of graduates for the spring semester, please be patient and allow 4-6 weeks for your diploma to be mailed. Degree candidates shall be responsible for making sure that all degree requirements are met and that all financial obligations are cleared. PHYSICALLY CHALLENGED - Anyone who is not physically able to participate or needs special accommodations should notify Gary McGill, Chief of Security, or Lisa Price, Vice President of Student Services. (Highlighted can be removed.) *Note: If you have any family members or friends needing wheelchair assistance onto the floor, please have them arrive at least 30 minutes before the commencement ceremony to be assisted. PHOTOGRAPHER - Please note that there will be a photographer for the commencement ceremony. Your picture will be taken as you receive your diploma cover on stage as well as when you line up, before you go across the stage. Picture ordering will be made available to you, if you choose to order, by email/mail a couple weeks after the ceremony by Lifetouch Photography. The site to view your pictures will be www.lifetouch.com. VIDEO STREAMING – For family members and friends who are not able to attend the ceremonies, video streaming of both ceremonies will be available on our website at rlc.edu/graduation. EMPLOYMENT RESOURCES – If you are seeking employment after graduation from Rend Lake College, please check out our online job board at www.rlc.edu/jobs, or if you are in need of job search resources or assistance with résumé & cover letter development, go to www.rlc.edu/careerservices. For questions regarding these services, contact Kaylee Smith at 618-437-5321 ext. 1264 or . FLOWERS – The Foundation will have red and white carnations available in front of the gymnasium on commencement day. They will be $2 per stem or at a discounted rate for a bouquet. For questions, contact the Foundation Office at 618-437-5321, ext. 1324.